One of the most anticipated numismatic releases of the year was launched as the U.S. Mint began taking orders for the 2016 Mercury Dime Centennial Gold Coin at noon today. The coin re-imagines Adolph A. Weinman’s classic design for the Winged Liberty (or “Mercury”) dime, struck in gold to honor the 100th anniversary of the original circulation issue. The coin is composed of 1/10 oz. of 99.99% gold, measuring .650 inches in diameter and .047 inches thick. As noted previously, these dimensions are slightly smaller that those of the original issues, since the Mint struck the new coins on a previously developed 1/10-ounce gold planchet. Staying true to the circulating purpose of the original dime, the gold reissue features a “business strike” finish. Its mintage is limited to 125,000 pieces, with orders capped at 10 per household. 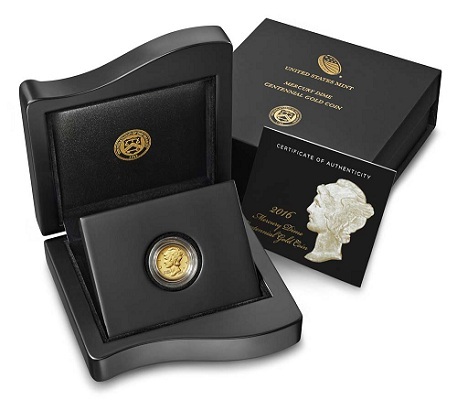 Each coin comes packaged in a custom wooden box with a certificate of authenticity. The gold dime is available for $205.00. This price will remain in effect as long as the value of an ounce of gold stays between $1,200.00 and $1,249.99, in keeping with the Mint’s pricing system for numismatic gold coins. The obverse of the Winged Liberty dime features an image of Liberty facing left and wearing a winged cap; the wings on the cap reminded some of the Roman god, Mercury, which led to the issue being nicknamed the “Mercury dime.” Inscribed along the rim are LIBERTY, IN GOD WE TRUST, Weinman’s initials, and 2016. The gold Mercury dime is the first of three 2016 coins conceived to celebrate the 100th anniversary of the introduction of the first Mercury (or Winged Liberty) dimes, Standing Liberty quarters, the Walking Liberty half dollars. Release dates for the gold Standing Liberty quarter and Walking Liberty half dollar have yet to be established. The full pricing chart for all three 2016 Centennial gold reissues can be viewed here. Update, 4:45 p.m.: As noted on Mint News Blog, the 2016 Mercury Dime Centennial Gold Coin went into “Currently Unavailable” status on the Mint’s Web site around 12:45 p.m. The Mint has yet to share first-day sales numbers for the item, so we don’t yet know how much of the coin’s 150,000-piece mintage limit has been sold. Thursday April 21, 2016 @ 09:45 PDT, the U.S. Mint website now indicates that the Gold Dimes are currently unavailable. Perhaps all 125,000 have been ordered within 45 minutes. It was not fun. The website did not work from the minute it went on sale and the phone lines were busy the entire time. So much for the lowly collector. I experienced the same with the 25th Anniversary Silver Eagles back in 2011. The website works like crap in high volume mode. However, I ordered from my mobile phone both times…seems like it works. Hey US MINT…recommendation: hold a lottery. 125,000 winners. Looks like these might already be sold out. Over 25,000 orders in the first hour. Mint website is now showing unavailable. Just for fun, 20 minutes later I checked the ‘sold’ listings on flea-bay and saw one of these has sold for $375.25, and two sealed boxes of ten went for $2,950. Much to the chagrin of all the collectors who weren’t able to get through – the profiteers are having a good day today. I did a change of password and after completing I could check out just fine. I got an order acknowledgement email at 12:13. For a 2016-W Gold Dime, ebay item #262398924380 sold for $395 this morning April 21, 2016 @ 10:13AM. $395/$205 is 92.7% instant profit. You mean “NOT Available.” Lowest price on ebay is now $275. A first strike 70 is $550. How this even happens when they haven’t shipped yet I don’t know. Another awesome release by the Mint yet a poor showing if you are a collector. I saw a couple comments about coins already being slabbed. Those are not actual photos of slabbed coins yet, Notice they are all stock mock up, not actual graded coins. Also all the people selling them are pre selling, they don’t actually have yet. Michael Bodge,” Shipping expected the 2nd or 3rd week in May!” This is direct quote from Coin Vault. Not only do that not actually have them in stock it appears they got their buy in after first batch of coins sold out. The mint estimate was second batch will be ready by May 6 so their estimated shipping date fits that timeline. Also, yes, they are using same mock up photo, not actually slabbed coin. Today is the 26th of April.